This student review is written by Matthew. This book is about a young teen and his friends being demi-gods and trying to fit into modern day lifestyle. Dealing with creatures working for the evil Kronos trying to kill Percy and his friends. Going to a normal camp to people, but to demi-gods and mythical creatures it is known as Camp Half Blood. Camp Half Blood is a place where people like Percy can learn combat and learn about their powers. The evil Kronos is growing even more powerful than before, while he is trying to take over Olympia's where the gods are. But the gods are off fighting another problem that worked out. So with Olympia's vulnerable Kronos is looking to take over. 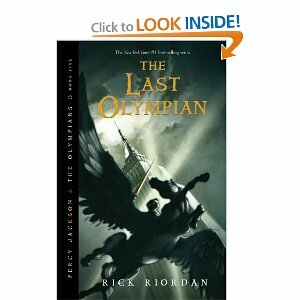 So it is up to Percy and his friends and all the demi-gods at Camp Half Blood to defend their parent's throne. As Kronos is closing in on Olympia's that is above the Empire State Building, Percy learns his true powers. I would recommend this book to everybody from fifth grade and up because this is a book that everybody can love. It is well written and action and surprises are at every corner.